Genesis: In the beginning, creation. Genesis: Eve and Adam: separation from the Divine; expulsion (death) from a garden. John at Christmas: In the beginning, creation. John on Good Friday: death in a garden, fracture, alienation. John at Easter: early on the first day … in a garden. The second Adam. New creation. John at Easter: Mary (that is, humanity) reunited with the second Adam. Restoration. In from the cold. If Mary the Mother of God is the feminine of the Divine, Divine Sophia (wisdom), a type of humanity, might not Mary Magdalene be also a different type of humanity? Jesus said ‘Mary’ and she knew who he was. New creation. A gardener He is then. The first, the fairest garden that ever was, Paradise. He was the gardener, it was of His planting. So, a gardener. And ever since it is He That as God makes all our gardens green, sends us yearly the spring, and all the herbs and flowers we then gather; and neither Paul with his planting, nor Apollos with his watering, could do any good without Him. So a gardener in that sense. But not in that alone; but He it is who gardens our ‘souls’ too, and makes them, as the prophet saith, like a well-watered garden;’ weeds out of them whatsoever is noisome or unsavoury, sows and plants them with true roots and seeds of righteousness, waters them with the dew of His grace, and makes them bring forth fruit to eternal life. But it is none of all these, but besides all these, no over and above all these, this day if ever, most properly He was a gardener. Was one, and so after a more peculiar manner might take this likeness on Him. Christ rising was indeed a gardener, and that a strange one, Who made such a herb grow out of the ground this day as the like was never seen before, a dead body to shoot forth alive out of the grave. 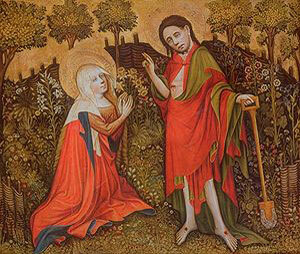 Jesus refuses her touch: Do not go on touching me … there’s work to be done. Go and tell the others … Resurrection and ascension are one process in John. Jesus and Mary Magdalene are Adam and Eve, reunited, in the garden. The lover and the beloved in the Song of Songs in the garden of love. Mary Magdalene is in Paradise, and so are we, if only we can see it. Jesus’ reborn body is the Holy of Holies, for the veil of the Temple has been destroyed. Now at dawn, redeemer and redeemed are together again in new Eden. ‘all creation is made new’. Frances Hodgson Burnet’s The Secret Garden has resonances.